One of the nation’s most respected and enduring actors, Uncle Jack Charles is a member of Australia’s stolen generation. Removed from his mother as a baby and raised in a Salvation Army boys’ home, Jack knew nothing of his Indigenous heritage as a child. At 19 he began a career as an actor, but his life was plagued by personal demons. His addiction to heroin and a life of crime saw him jailed. Despite his struggles, he co-founded Australia’s first Indigenous theatre group, Nindethana, meaning ‘place of corroboree’, at Melbourne’s Pram Factory in 1971. His first play, Jack Charles is up and fighting, was a runaway hit. Jack appeared in several movies, including the landmark film, The Chant of Jimmie Blacksmith and more recently features in the new Warner Brothers blockbuster “PAN” alongside Hugh Jackman. Uncle Jack has also toured this own one-man stage show locally and internationally. 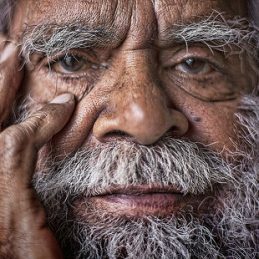 Now calm and centred, Jack Charles is a strong role model for a new generation of both black and white Australia. Uncle Jack Charles is an inspiring speaker who will entertain and inform your audience on a range of defining aspects of our society: Racism, Indigenous and gay rights, Survival and generally standing up for what you believe in! To get a taste of the incredible journey he has navigated through life click to see him speaking on YouTube.